Cold press juicers became a way too famous last year, and there were literally too many reasons behind the enormous popularity of these juicers. The slow juicers are, as the name suggests these juicers are relatively slower than their traditional counterparts, but the reason why more and more people are getting attracted towards the slow juicers is that they provide healthier juice than the fast juicers. 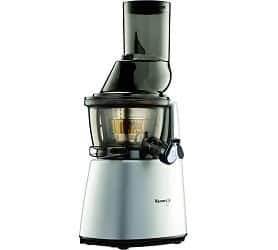 Technically, the fast juicers that are used in most kitchens, moves in a way too quick and does not extract the complete juice of the fruit, or leafy veggies. On the other hand, the slow juicers have a slower revolving rate that makes full use of the pulp. 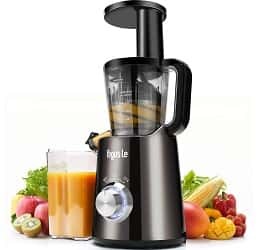 So, if you are looking for a healthier option to make juices and smoothies, it is advised that you choose the juicers with lower RPM so that you can fully utilize the pulp. The slow juicers (juicers with lower RPM) are more reliable and healthier option to make the juices for your loved ones. So, instead of choosing the juicers having higher RPMs, choose the juicers with lower RPM. Another thing that you should look for while buying a slow juicer is the list features, safety mechanisms, warranty, and after-sales services. These things will help you buy a great slow juicer for your home that not only will provide you with the best value for money, but will also help you move a step closer to the healthy lifestyle. 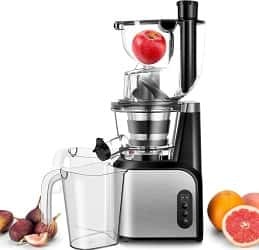 Also see the list for the Best Citrus Juicer 2019. This is one of the best masticating juicers on the market. This slow juicer for Aicok is designed to extract maximum juice and that wide inlet enhances the usability of the juicer and lets the user to extract the juice of a variety of fruits and vegetables. This slow juicer rotates at the speed of 60 rpm which is adequate enough to extract 30% more juice and 40% more vitamins and minerals than famous fast juicers available in the market. 150W heavy duty powerful DC motor generates enough power to keep the juicer running for continuous 10 minutes. Although the juicer comes under the category of slow juicers, but it is not too slow to be boring that makes it a great buy for the homemakers. The juicer is fast enough to 8oz. cup of juice in just 5 seconds. So, you won’t have to wait for too long to get your cup of juice. You can adjust the speed of the juice extraction from Fast and Slow. Also, the extra wide chute of the juicer helps it to handle larger fruits and larger bunches of veggies better than the other slow juicers available in the market. Comes with a cleaning brush and Nylon bristle brush. You won’t have to buy separate cleaning brushes to clean the juicer. In case you were looking for a slow juicer that not only works efficiently but also looks great in your kitchen, then you should look no further than the SW-2000. Apart from the great looks, and efficient working, the SW 2000 has numerous features that make it an ideal slow juicer for home. The speed of 47 rpm makes it one of the most reliable and slowest juicers available in the market. 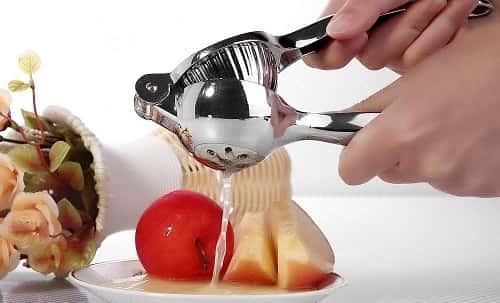 Unlike the other juicers, this juicer has a mincing attachment that enhances the usability of the juicer and helps the user to use it as a mincer too. 100% BPA-free Housing & Casing makes it a safe tool to be used at home. In case you live in a bigger family, then you should look for a juicer that has a wide mouth and has a great set of features to make it a perfect buy. 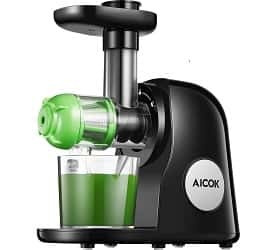 Aicok Juicer is a great product that you can rely upon. 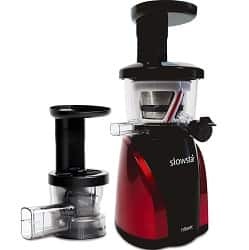 This juicer has a 75 mm wide mouth that makes it a perfect juicer for a larger family.Additionally, the speed of 60 rpm makes it a great option for those buyers who are looking to buy a reliable slow juicer for their home. Those buyers who are looking forward to buy a multi-purpose cold press juicer for their home that can extract juices of numerous fruits and veggies in a jiffy, the Aicok Slow Juicer with reverse function can be a great buy. 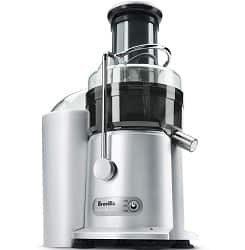 This is one the quietest slow juicers available in the market. Brilliant customer care service and 3-year warranty make it a reliable product to have at home. The best thing about the Mooka slow juicer is the durability of the product. You can choose this juicer if you are looking forward to buy a slow juicer that can easily serve you for many years. The product comes with an industry-best 10-year warranty (on motor) and this makes it a perfect home equipment. Quiet motor that you rely upon. Upgraded juice extraction system makes this slow juicer extremely efficient and quiet. The juicer is durable enough to be used and the company provides a 2 year warranty that makes it a great product for home. The motor produces noise of 60db. 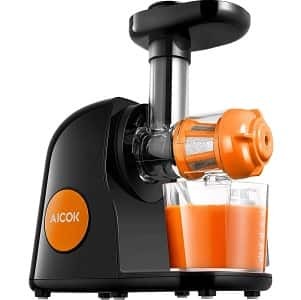 So if you were looking for a juicer that is quiet, easy to use and has enough features to be used for years without an upgrade, then go with Aicok Juicer, you won’t be disappointed. Made up of PMMA material that makes it safe even for the babies. The C7000S is one of the very few vertical slow juicers that have a wide 3-inch opening to make it easier to accommodate a large bunch of veggies and large fruits as a whole. The low-speed juice extraction technology gently squeezes ingredients and helps it extract the maximum juice. The powerful 240w motor makes it possible to deal with hard-shelled fruits and a large amount of veggies easily. This advanced slow juice from To box is a perfect choice for those who are willing to buy a product that won’t be outdated soon. The juicer has a double feeder chute that can easily accommodate a whole fruit of 3 inches. So, you won’t have to make unnecessary pieces of the fruits to get the maximum juice from them. So, these were the ten slow juicers that you can buy today. All of them are great products in their category and if you can’t decide which slow juicer you should go with, then this list will be quite beneficial for you. Fruit and vegetable juices are replete with nutritional benefits. There are many kinds of juicers available in the market. The two main types of juicers are centrifugal and cold press juicer. Cold press or slow juicer use a dual-step extraction process to extract juice from fruits and vegetables. They are also known as masticating juicers. If you are looking for a good cold press juicer, consider the following factors before purchasing. Vertical Masticating Juicer – Vertical Masticating Juicer is suitable for kitchens of all sizes by virtue of its compact design. Vertical juicer is suitable for juicing soft fruits and berries. It also performs well with fibrous green vegetables. This type of juicer is also equipped with a self-cleaning system which makes it easy to clean. Horizontal Masticating Juicer – Horizontal Masticating Juicer is highly suitable for juicing green leafy vegetables although its performance is good with fruits and other ingredients too. People more into vegetable juices can go for this type of cold press juicer. Design of the juicer – Cold press juicers come in a plethora of design, shapes and sizes. Compact juicers are suitable for small kitchens. They also have fewer parts to clean and can be stored easily. Good pulp ejection – The cold press juicer should have an external or internal pulp collection container. It is better if the juicer has an external pulp ejection system. This is because an external system prevents the need to frequently stop the machine, opening it and emptying the pulp container. You can continue to extract juice without stopping. Pulp Yield – The cold press juicer should provide a good amount of pulp yield in the juice. The presence of a good amount of pulp in the juice not only improves its taste but also increases the nutritional value. 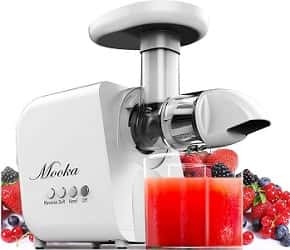 Motor Speed – The motor power of the cold press juicer should be according to the amount of juice you require in a day and the type of juice you want to extract. For juicing leafy vegetables, the motor power should be minimum 400 watts. Cold press juicers operate on low RPMs which enable them to extract juice slowly and thoroughly so as to retain more nutrients and fibers in the juice. Thus, the juice produced by a cold press juicer is healthier and more tasty. Size of the feeder tube – A cold press juicer with a wide feeder tube reduces the time spent on cutting fruits and vegetables in order to accommodate them in the tube. The width of the feeder tube should be sufficient to fit in large sized fruits and vegetables such as carrots, oranges, apples, guava, beet root, etc. Versatile nature – The cold press juicer should be able to extract juices from all kinds of fruits and vegetables. There are cold press juicers which cannot extract juice from leafy vegetables but work only with soft fruits. Such juicers must be avoided until and unless you don’t like vegetable juice. 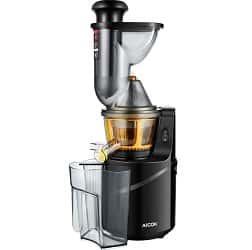 Availability of spare parts – The spare parts of the cold press juicer must be easily available in the market if it breaks down due to any reason. Brands – You should look for the top brands when buying a cold press juicer. The reputed juicer brands provide high quality cold press juicers in addition to good warranty and instant customer support and after-sales service. Cleaning the cold press juicer properly is very important to prevent bacterial growth and discolorations. Scrubbing pad with sponge on one side and abrasive scrubbing surface on the other side. Tough nylon brush or a toothbrush with hard bristles. Put the diassembled parts of the juicer in warm water. Use the nylon brush or toothbrush to remove fruit or vegetable particles from the filter basket. Use pipe cleaning brush to clean difficult to reach areas. Use the scrubbing pad to clean all the parts. Areas with tough dirt build-ups or gunks should be allowed to soften in warm water before scrubbing. Use the plastic spoon to remove pulp residue. Allow the parts to dry. Juices are considered the best way to live a healthy life. 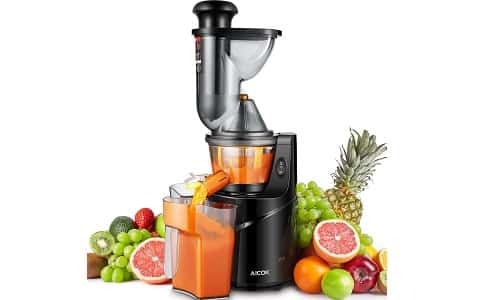 However, instead of using the juicers with higher RPM use the juicers with lower RPM which will help you to get more nutrition that would have been lost with the pulp on fast juices. Just make sure that you make the decision carefully after reviewing all the features and motor capacity to make it a pleasant buy. All these juicers have the brilliant build quality and are covered under a good warranty, so you won’t need to worry about the service warranty from the manufacturer. So, choose any of the slow juices from the above list and start living a healthier life.